emissions, the deviation stands at 0.14% towards the lower side. It suggests that despite population growth, absolute petroleum consumption in California is marginally decoupling vis-a-vis a growing economy. 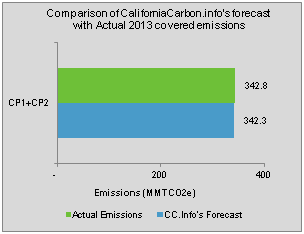 The time-series econometric analysis conducted by CaliforniaCarbon.info suggests that the WCI carbon allowance market will be long by a cumulative total of 290 to 300 million tons by 2020, and remain annually oversupplied till 2020. For the year 2013, the WCI carbon allowance market was oversupplied by approximately 24-25 million. The effective surplus will decline as allowances are withheld under the Annual Price Containment Reserve (APCR) (1%, 4% and 7% of the total annual allowances budget for 1st, 2nd and 3rd compliance period respectively), as long as auction prices remain below the APCR trigger price. Despite the decline in effective surplus, the market is expected to see annual surplus till 2021. The first annual shortage will be seen in 2021, with an annual shortfall of approximately 9-10 million CCAs, but due to a large oversupply of allowances, and also since banking of allowances (and offsets) is allowed between different compliance periods, the market will remain substantially oversupplied until 2026.